Remember those “I’m with stupid” shirts with an arrow pointing to the person beside you? Weren’t those hilarious? Well now, athletic brands like Nike are producing T-shirts that point the attention on the wearer, but with positivity. 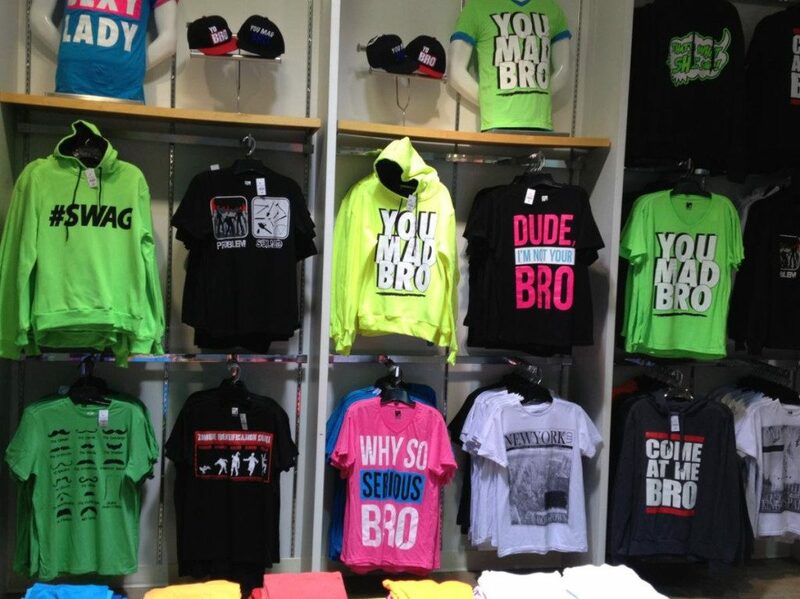 I’m referring to the “I’m so awesome” shirts, which aren’t funny at all—they are actually a bit aggravating. To have the gall to wear a shirt promoting how great you are all day makes you an egomaniac, and that is not exactly a good first impression. Some might say their apparel isn’t meant to bring anybody down; they are simply inspirational quotes. Thanks, but I don’t need to get my inspiration from looking at your bulky torso. I know you work out—you’ve been talking about it all day. I don’t need your shirt to remind me too. If you want to inspire someone, don’t rehash old sayings. “Just do it,” it says. “Then do it again!” How droll. There is a thin line between being confidently motivational and arrogantly ambitious. And the line can be crossed simply by wearing those shirts outside of your bedroom or the gym. When someone walks by me wearing a T-shirt that says “Don’t sweat my swag,” in bold, colourful text, I am unsure what to make of it. Is it just workout slang or a subtle putdown? I’m really not sure. But perhaps pondering the meaning of such a phrase is in fact sweating the swag. T-shirts are the perfect canvas for showcasing personality and interests. Yet, we are constantly changing. I just have to look through my own closet to find old relics of places “I heart” and concerts I’ve attended. The T-shirts I’ve accumulated over the years become a little history book of my life. What I wore when I was 17 is different from what I wear today. Like looking at old pictures, we remember how stupid we used to look in those Ed Hardy T-shirts and V-necks. Oh wait—we still wear those. The casual look is the reason we choose to be in a T-shirt, but it is still important to stay classy. No matter how athletic, intelligent, and confident you are, your bad taste will tell the world otherwise. Save your witty quotes for Twitter or bathroom stalls. Don’t wear them on your chest as if “YOLO” is the name of some sport team you play for. If your shirt says, “I’m the best,” then you’d better live up to it.